There are several wonderful cocktails that I wanted to feature as Drinks Of The Week that contain absinthe, a strong, herbal spirit that was illegal for many years in the United States. However, I usually like to describe the ingredients and felt that I couldn't do absinthe justice in the context of a recipe post. For some readers, this may be review, but I find that there are plenty of people out there who know very little about absinthe and might appreciate being brought up to speed on the subject. 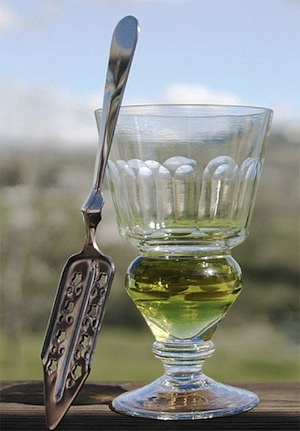 With all of the controversy and myth surrounding it, I decided to take the opportunity to feature absinthe itself—once a very popular drink in its own right—describe how to prepare it properly, and give a little background so that everyone can understand what it is, what it isn't, and why this innocent liquid has such a not-so-innocent reputation. Entire books have been written on the subject, so I won't go into great detail, but there are a few interesting historical points as well as some misconceptions that everyone who is interested in absinthe should understand. First of all, you need to know what absinthe is. Absinthe is an herbal distillate usually around 60-70% alcohol—not something you can really enjoy on its own—that contains wormwood, anise and many other botanicals. The production process is very similar to gin in that the botanicals are macerated in a neutral alcohol. 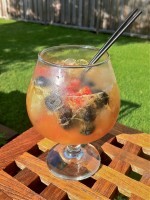 After a period of time, the alcohol extracts the herbal flavors and it is redistilled. Often, a secondary maceration is used to extract chlorophyl from the herbs in order to get a green color. Depending on the botanicals used, absinthe can exhibit an incredible variety of flavors and aromas, but it is usually associated with anise. When prepared under an ice water drip (explained below), the intoxicating floral aromas can fill a room. Hopefully after reading this, you will change your mind about any misconceptions you may have had about absinthe, but that's about the extent of it's ability to bend your brain. Most of the controversy comes from two things: a chemical called thujone and a very successful slur campaign. First, let's address the chemical myth. It's true that grande wormwood (Artemisia absinthium), an important ingredient in the maceration process and where absinthe gets its name, contains small amounts of a chemical called thujone which was blamed for producing psychoactive effects in the brain. Similar in shape to the chemical compound THC found in the cannabis plant, recent analysis has revealed that thujone does not behave like THC in the brain and that substances other than wormwood contain surprisingly high amounts of thujone and are considered food-safe by the FDA such as oregano, sage and sage oil (which can contain 50% thujone). The fact is that even with high dosages, you would die of alcohol poisoning drinking absinthe long before any effects of thujone. Nevertheless, absinthe sold in the EU and the US today is considered "thujone-free" which means that it cannot contain more than 10mg/kg. Like many spirits, absinthe started as a medicinal remedy but it eventually grew to become a popular beverage. Initial recipes called for grape distillate which put the drink into the hands of the wealthy. However, as it's popularity grew, producers realized that they could use neutral grain spirits as a base and make a product that was affordable to the masses. Working class people and poor artists could afford to be inspired by the "green muse"—much to the displeasure of wine makers and grape growers. 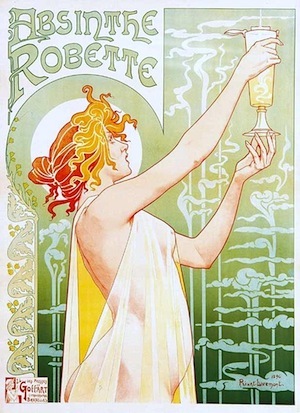 In France, absinthe was becoming so popular by the late 1800's that it was almost named the national drink! Can you imagine anything but wine as the national drink of France? Started by the Temperance Movement and backed by winemakers' associations, absinthe became associated with crime, misconduct and social violence. Alleged ill-effects such as hallucinations were popularized by bohemian artists and writers such as Vincent Van Gogh, Toulouse Lautrec, and Oscar Wilde. Absinthe drinkers became the subjects of masters like Manet and Degas. Then, in 1905, it was reported that a Swiss laborer named Jean Lanfray had been convicted of a drunken rampage, murdering his pregnant wife and two kids followed by an attempted suicide. Earlier that afternoon he had consumed seven glasses of wine, six of cognac, coffee with brandy, crème de menthe and two glasses of absinthe. Never mind all of the wine and brandy—the absinthe made him do it! At least that's how the story was told, and within a few years, absinthe was legally banned all over Europe and the United States. In the 1990's, importers in the UK discovered that absinthe had never been banned in that country. They began importing brands from Czechoslovakia and a cult following ensued. Several European countries eventually repealed their bans. In the US, products made with wormwood are still regulated. Citing the ill-effects of thujone, absinthe was made illegal in 1912 due to this association alone. The FDA ban required substances to be "thujone-free" or less than 10mg/kg. The irony in all of this controversy is that recent chemical analysis of pre-ban bottles reveal that they contain only small amounts of thujone—amounts legally passible. The simple fact is that most original absinthes have actually been chemically legal all along according to the FDA guidelines. The only challenge producers and importers faced was the approval of bottling labels. By early 2008, Lucid brand absinthe became the first legally available in the U.S. since 1912. Several other brands have followed. 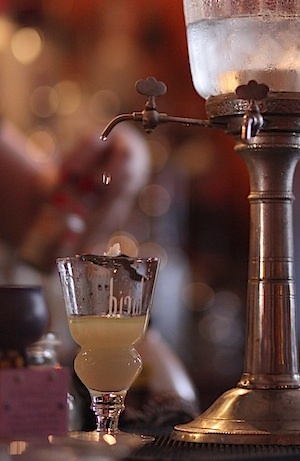 Prepare in the traditional manner by pouring a dose of absinthe into a glass. Place a lump of sugar upon a slotted absinthe spoon and set it across the top of the glass. Slowly drip ice cold water over the sugar and into the glass until the absinthe changes to an opaque pearly white throughout (usually about 3-4 ounces of water). Remove the spoon and serve. 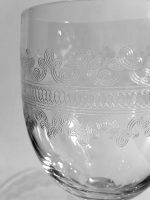 Most absinthe glasses have a mark or a decorative line to indicate the proper dosage which is usually about an ounce or a little more. It's important to use ice cold water which can be put into a carafe ahead of time or into an absinthe fountain if you are lucky enough to own one of those. The fountain is a glass bowl on a stand with tiny spigots that can be opened to allow a steady drip to fall into your glass. Some prefer to skip the sugar, but I like it. The drip seems tedious, especially if you are painstakingly pouring your ice water by hand, but it's important. More than just a ritual, the icy drops of water dilute the absinthe little by little. As the water hits the spirit, you will see a swirl of opacity. This "fairy-like" translucency swimming within your glass is actually complex essential oils and herbal compounds no longer soluble as the drink dilutes. As this louche effect occurs, perfume fills the air. The gradual dilution and slow temperature change is an important process that opens up the flavors in your absinthe and allows your senses to experience everything this spirit has to offer. It's just not going to happen this way if you simply dump in 4 ounces of cold water. As you sip the drink, you immediately notice the anise or fennel flavors that are dominant in most absinthes, but there is a lot more going on in this drink than just a licorice taste. Even if you hate black jellybeans, it's worth giving absinthe a try. When I drink it I notice a numbing effect on my tongue and the sweet herbal aromas are hard to describe. It's easy to see how sipping absinthe in this manner became so popular in bistros of the Belle Époque. Now, I am not going to paint any masterpieces after a glass or two, but I am not about to cut off my own ear either. If you have had absinthe, let me know about your experience. If not, give it a try and post a comment describing what you think about it. This is a very interesting article about absinthe. 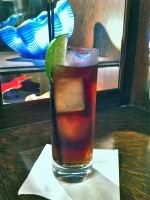 "The invention of the cocktail 'Earthquake' or Tremblement de Terre, is attributed to Toulouse-Lautrec; a potent mixture containing half absinthe and half cognac, (in a wine goblet, 3 parts Absinthe and 3 parts Cognac sometimes served with ice cubes or shaken in a cocktail shaker filled with ice)." Sounds like a potent recipe. Interesting mix of flavor. If you aren't drinking absinthe with water and making a cocktail instead, it can easily dominate. Most cocktails that call for it, like the Sazerac, call for very little--sometimes even just to rinse the glass and dump. That's enough to flavor the whole drink! This is way over the top, and yet, as to be expected from a time when you were either drinking absinthe, cognac, or in this case, both! Great post, Randy. I recently discovered a local distillery in Washington making a classic absinthe and picked up a bottle. A few drops does indeed change the whole flavor of the cocktail and I definitely appreciate the sazerac so much more now. Any idea where to find a vintage fountain? Seems like a great conversation piece for the bar. Vntage fountains are pretty hard to come by now. The obvious source is probably eBay, but you might have better luck on the French version of eBay. You could end up paying top dollar for a functioning antique. I would probably go for a reproduction in stainless steel.